We were proud to collaborate with the Center for Political, Leadership, Innovation and Service to host a panel discussion on citizen activism. 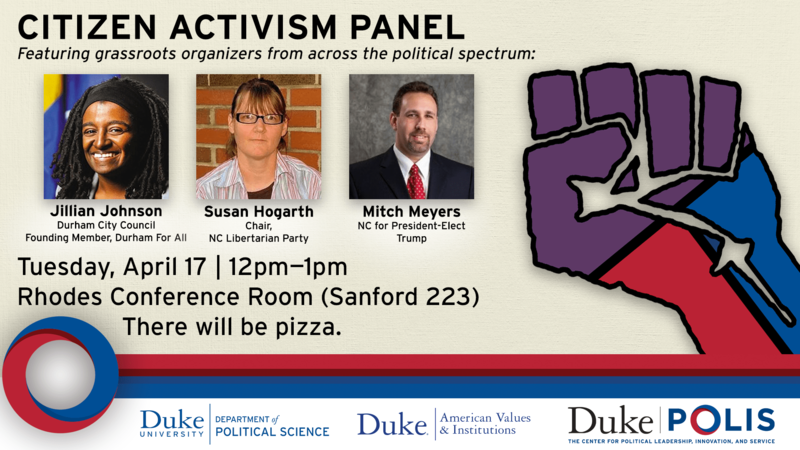 All three panelists—Durham Mayor Pro Tempore Jillian Johnson, chair of the NC Libertarian Party Susan Hogarth, and former organizer with NC for Trump Mitch Myers—have years of experience with grassroots organizing. Moreover, they offered different perspectives on how citizens can be politically involved, despite not completely identifying with either of the two major political parties. Myers sought to change the Republican party from within; Johnson ran for local office to ensure more progressive voices in Durham politics, and Hogarth has been actively organizing a third party. The panelists were honest about their struggles, but they also suggested that citizen activism can be a lot of fun. Click here to learn more about the discussion! Duke AVI is powered by WordPress at Duke WordPress Sites. Please read the Duke Wordpress Policies. Contact the Duke WordPress team.